Fire-roasted rotisserie California burgers anyone? Rotisserie Central > General Category > All Things Auspit (www.AuspitBBQ.com) > Rib-o-Lator Central > Fire-roasted rotisserie California burgers anyone? "As the current front runner in last/this week’s Beef Rib Throwdown, I figured I better flip a burger in the ring for this round, too. The Burger category has clearly prompted more people to dust off their winterized grills and re-don their aprons to join in this battle. The quality of entries is intimidating! I will say these throwdowns are fun. You guys crack me up. The earlier Godzillaburger references seem very apropos. I would not want to run into many of the competitors’ burgers in a dark alley. I am in California for the moment where the earthquake risk is too high, so you will see that rather than building upwards, I went outwards. My burger shape coincides with the peppers and flat breads I selected. A pool backdrop seemed like a nice pairing for burgers. With the competition coming in so fast and furious this time, I figure the only way I could have a chance was by breaking out my secret burger weapon! I tried to stay true to California cuisine, so there is plenty of cilantro and avocado. The burger meat is mixed with fresh cilantro, onions, garlic powder, Worcestershire, and a few other spices. The burger layers in order are: garlic herb flatbread, bed of arugula, burger, thick-sliced bacon rails, Monterrey Jack cheese, thick-sliced cheddar bars, pasilla pepper, mix of sweet and red onions, chipotle salsa, and flatbread. The avocado and tomatoes are to be added at your leisure. The corn, fresh green beans and mushrooms are just sides. My one significant digression was that I just had to go with hickory wood for this one. I had some eucalyptus and avocado wood available which would have been more “Californian”, but my mouth watered too much every time I thought about hickory roasted rotisserie burgers. OK, my beer pairing with this burger is actually also not of California origin, but this was also worth making an exception for. With its coffee and chocolaty flavors, the 1554 from New Belgium Brewing Company is an amazing beer with burgers (and anything else for that matter). Unfortunately I was too busy drinking mine to remember to include it in the entry photo! BTW, thanks guys for all the votes in the Beef Rib Throwdown...I already feel like my non-beer consumption that day was worth it! Re: Fire-roasted rotisserie California burgers anyone? OK Jon everything looks fantastic and ready to go........but I want to know what you are using to hold your wood and stand your auspit on on that pool deck? Nice catch! I was using one of our still-in-the-works Auspod prototypes. We are working feverishly to come out with a production model up and going but it is taking an inordinate amount of time. I know a lot of people want one. It should be here well before Christmas 2010, but you never know. Was just curious. 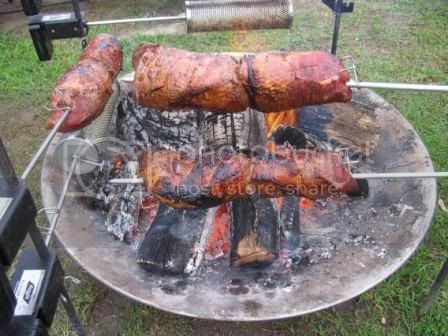 On the aussie site don't they have a ss round fire pit?? 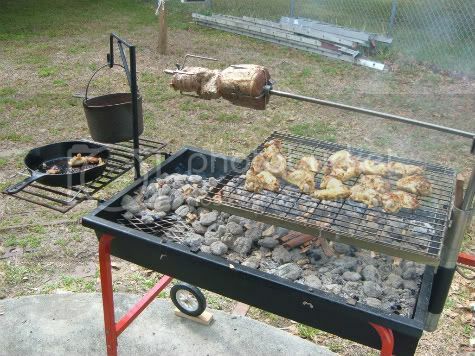 Yes, they do have a stainless fire pit available in a few sizes in Australia. I have brought them into the US for a couple people that placed special orders. They are great quality, but are priced considerably higher than a lot of fire pits you find here in the US. Theirs is designed specifically to cook over. 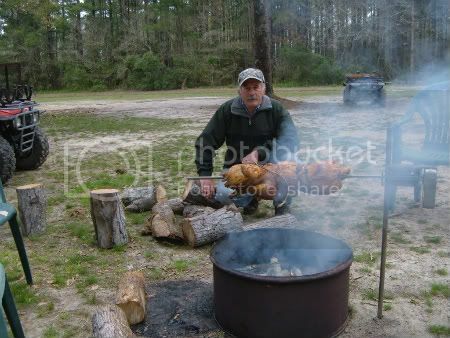 At trade shows in Australia, they are known to run 16 Auspits on one fire pit when doing catering events. That has to be an impressive sight! Out of curiosity how much to get one here?? Paul, this is a photo of our 4 foot dish with 6 spits in operation at a trade show in Australia, can't find a photo of any more but next time we do it, I'll be sure to take a photo for you.